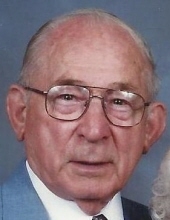 CASIMER (CASEY) KALMAN Age 99. Dearly beloved husband of Jeanette “Jean” (nee Kwiecien) for 73 years, passed away November 18, 2018. Dearest father of Janice Leach (Wayne), Christine Evans (Thomas), Kathleen Henry (Wynn), Casey Kalman (Cindy). Cherished Grandfather of Jennifer Ference, Ryan Wasserman (Katelyn), Michael Wasserman, Erin Evans Rudy (Jonathan), Jamie Kalman Amadeo (Marc), Sara Kalman, Windy Henry and Rachel Kalman. Loving Great Grandfather of Grace and Michael Ference, Conor and Claire Rudy and John Casey Amadeo. Brother of the late Irene Krecji, Ted Kalman, Sigmund Kalman and Wanda Huter. U.S. Army Veteran served in WWII in the 194th Glider Infantry Regiment and fought in the Battle of the Bulge. Casey was deeply committed to his faith, family and friends. He loved life and had a passion for ballroom dancing with Jean to music from the Big Band era. Casey enjoyed his Browns, Indians and Notre Dame Football…the Browns treated him to a win in the last game he watched! He and Jean were dedicated members of St. Bernadette’s Parish in Westlake for over 55 years. He will be greatly missed. Family will receive friends on Friday, November 23 from 4 – 7 pm. at McGORRAY-HANNA FUNERAL HOME OF WESTLAKE, 25620 Center Ridge Rd. (West of Columbia). Funeral Mass will be on Saturday, November 24th at St. Bernadette Catholic Church (2256 Clague Rd.) at 10:30 am. Interment Holy Cross Cemetery. With our deepest gratitude and appreciation, the family thanks the most dedicated and passionate caregivers at Avon Oaks Caring Community – you provided such warmth, compassion and love to our parents. In lieu of flowers, the family suggests memorial contributions be made to the Activity Programs at Avon Oaks Caring Community, 37800 French Creek Rd., Avon OH. 44011 or to the St. Bernadette Parish Pious Trust Fund (for renovation), 2256 Clague Rd., Westlake, OH. 44145. "Email Address" would like to share the life celebration of CASEY KALMAN. Click on the "link" to go to share a favorite memory or leave a condolence message for the family.